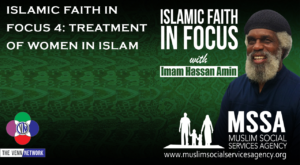 Following last week’s episode where Imam Hassan explained how hatred and racism have no place in Islam, he addresses the issue of the treatment of women in the Islamic faith. We should treat the women in our lives; be they our mothers, our daughter, our wives, or sisters, in a manner that we would want them to treat us. We have to remember our daughter watch how we treat their mothers, and they grow up expecting to be treated the same way in their marriages. We are asked to remember that Adam (May Allah be Pleased with Him) was so lonely that he begged and begged Allah for a companion, thus Allah gave him Eve as a companion. Our wives are our aids, not our maids. So tune in to this episode of the podcast to get the truth on how Muslims are supposed to act towards women, after all The Prophet Muhammad (pbuh) did say “Your Heaven lies under the feet of your mother” [Ahmad, Nasai]. And don’t forget that we are introducing the new Venn Network t-shirt, which you can own by heading over to Amazon.com. When you buy one of these shirts you help, not only support the network, but you also help support the hosts. The Venn Network is growing, and it is only with support from listeners – like you – that we can reach those in need of hearing our message!